After a recent Friday afternoon downtown photo shoot, we found ourselves trying to decide on a place for dinner. It was early, just 5:30, and we were near the North Shore area, so Foodworks it was. I pulled into the small parking lot and found it full. There was a sign saying extra parking was across the street, which was a paid lot. There was a lot right next door, but it said that it was for the other business only. Unhappily, I finally made it across Manufacturers Road traffic into the lot across the street. When we entered we were told that we could sit at the bar or outside, but that there would be a 45 minute to one hour wait for a table. We settled on outside, since I didn’t want to sit my big camera on the bar. It was a little breezy, but nice. Our waiter checked on us within a few minutes after sitting down. 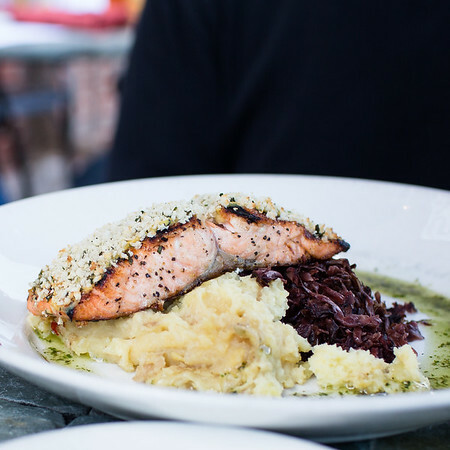 We had already looked over the early bird menu and decided on that – you get an appetizer, entree, and dessert for $20 a person. I ordered the Caesar salad, Grilled Mahi Mahi and the Bread Pudding. 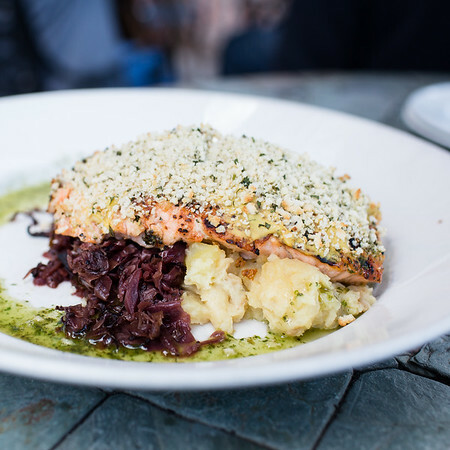 My husband ordered the House Salad, the Horseradish Crusted Salmon and the Bread Pudding. While we waited for our salads, I noticed people parking in the lot next door and others parking across the street like we did. I meant to ask if it is okay to park in the lot next door but forgot to – it would certainly be much easier. When our salads arrived, while mine was good, my husbands looked especially good! 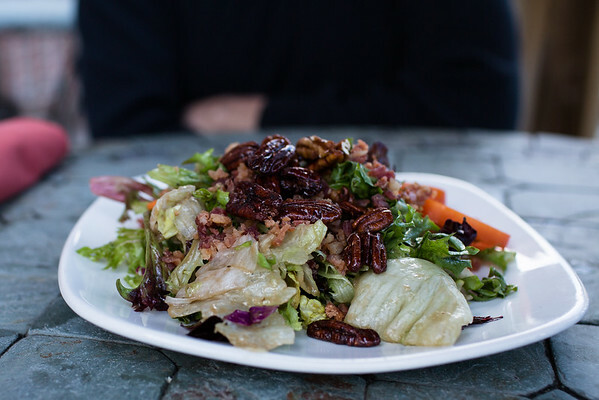 His house salad had: fresh greens, tomatoes, smoked bacon & candied pecans tossed in house honey balsamic vinaigrette. 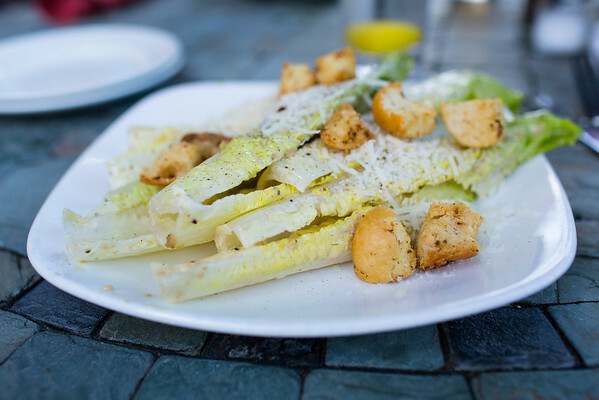 If I had read that description, I would have definitely chosen it over my Caesar, which was whole leaves of romaine lettuce tossed in a dressing, topped with cheese and croutons. Both of our entrees were excellent. 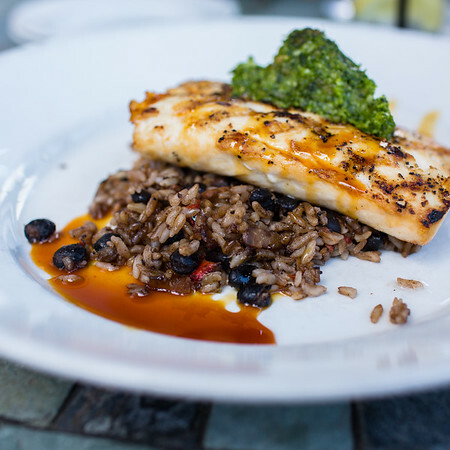 My Grilled Mahi Mahi was resting on red beans and rice with an ancho chile glaze and topped with a cilantro pesto. The flavors blended together perfectly. The ancho chile glaze was especially tasty. My husband said his horseradish crusted salmon was excellent. It was paired with Yukon gold mashed potatoes and braised red cabbage. With the sun going down it was getting a little chilly on the patio, so we got our bread pudding to go. I have to say that it was a little bit of a disappointment. My piece was small and thin and cut from the corner, my husbands was a much larger center piece. I’ve had their Coffee Bread Pudding before and it was excellent. I couldn’t even tell if this was the same bread pudding, I certainly didn’t find or taste anything that led me to believe it had any Heath bar in it and it was extremely dense. Perhaps it was just an off night. Overall, we loved the entrees and the salads. Will try the bread pudding again and hopefully it will be as good as it was before.